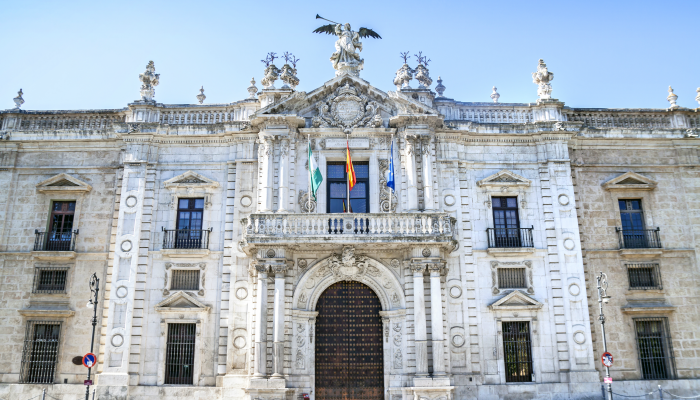 Think of Seville and oranges, flamenco and opera all spring to mind, but there’s a lot more to be seen and done in Spain’s fourth largest city. 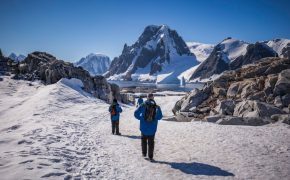 Around 700,000 people call this place home and the locals love it so much that many of them will stay here their whole lives. 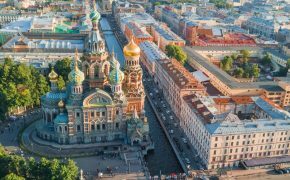 Given that its brimming with culture, fascinating history, stunning architecture, delicious food and wine – it’s easy to see why. So, if you’re planning a trip to the Andalusian capital, here’s a list of ten things you can’t miss. A blur of stomping feet and swishing skirts, flamenco is a treat for the senses. 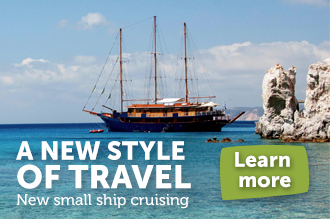 Originating in the 15th century when gypsies first arrived on the Iberian Peninsula – it’s had a long history in Spain. Seville, and the barrio of Triana in particular, have produced some of the finest dancers in the country making it the perfect place to take in a traditional performance. 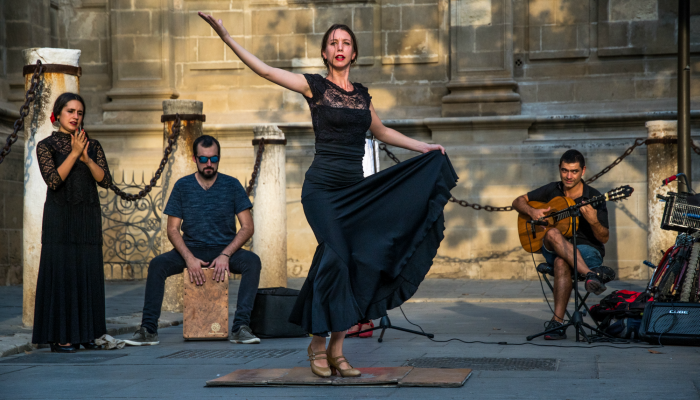 You’ll find plenty of spots in the old city centre such as Casa de la Memoria, but if it’s a more intimate and local flamenco experience you’re after hop on a bus to down-to-earth Triana. Embracing visitors like a pair of open arms, the Spanish Square is undoubtedly Seville’s most spectacular plaza. Built to celebrate the blossoming relationships between Spain, its South American colonies and Portugal, it also played host to the 1929 Ibero-American Expo. Sadly, Aníbal Gonzáles, the famous architect responsible for its design, died just months before its completion. The base of the building is decorated with painted ceramic tiles from Triana, and each section tells the story of a significant moment in Spain’s history. 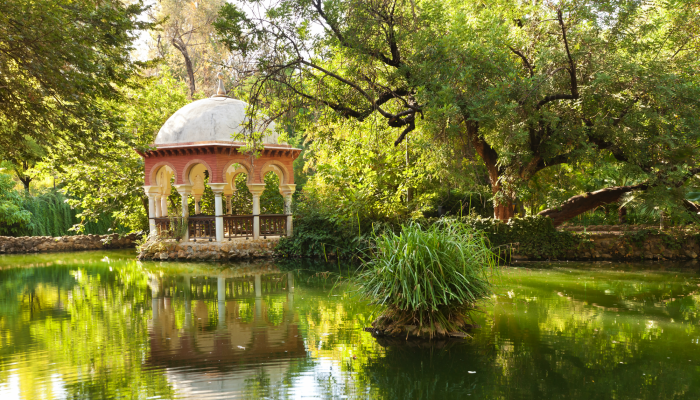 Encircling the Spanish Square is Seville’s oldest and largest green space, the Maria Luisa Park. Named after the Prince of Spain’s sister it was donated for use by the public when she died in 1893. Stretching along the banks of the Guadalquivir River it offers a welcome respite from the bustling city beyond its walls as well as a shady spot to escape the searing heat of the Spanish sun. As you walk through the gardens and down boulevards, look out for local flora like Mediterranean pines, ornate Moorish fountains and green parrots. En route to the medieval Jewish quarter, you’re likely to stumble upon the quaint Murillo Gardens. They were created in memory of the well-known Portuguese painter of the same name, who was born in Seville during the 20th century and lived here his entire life. He painted for important figures and was sometimes described as The Painter of Heaven for his soft, ethereal style. 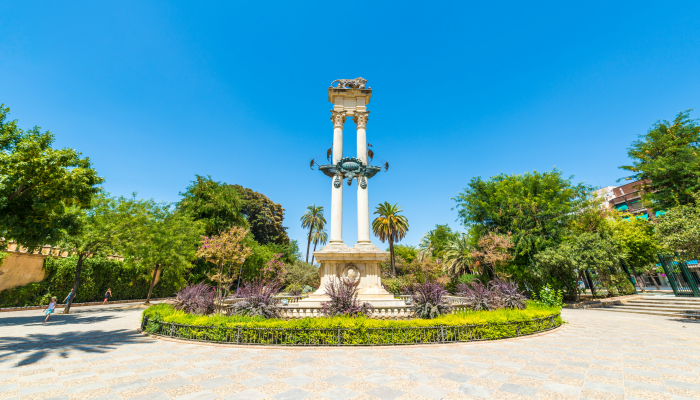 In the centre of the gardens, you’ll find a monument to Christopher Columbus featuring the Pillars of Hercules, a model of the Santa Maria and topped by a lion. 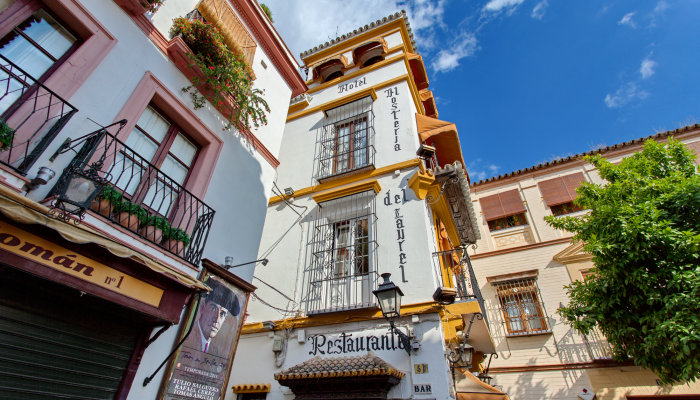 Inhabited by the Jews after the Inquisition, Santa Cruz is easily one of the most charming areas in Seville. As some of the top doctors and bankers of the time, these families were protected by the king and provided him with plenty of wealth in return. Nowadays this network of winding alleys is home to a bounty of tapas bars and ceramics shops. Be sure to admire the many pretty courtyards fringed by bitter orange trees and stop by Kiss Street too, so named because its narrowness meant couples could kiss from the balconies on each side. 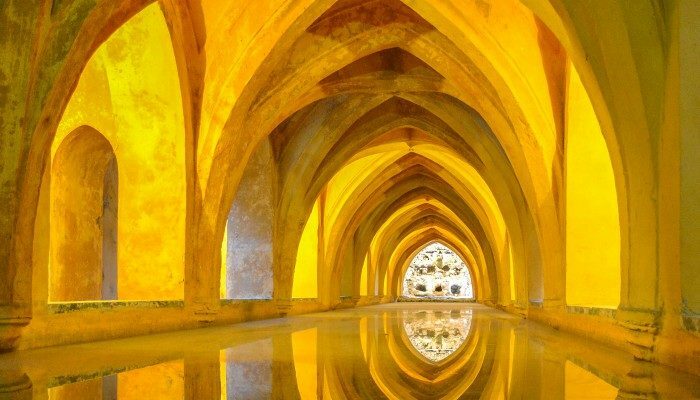 On the site of an ancient Abbadid Muslim fortress proudly sits Seville’s vast and impressive Alcázar. 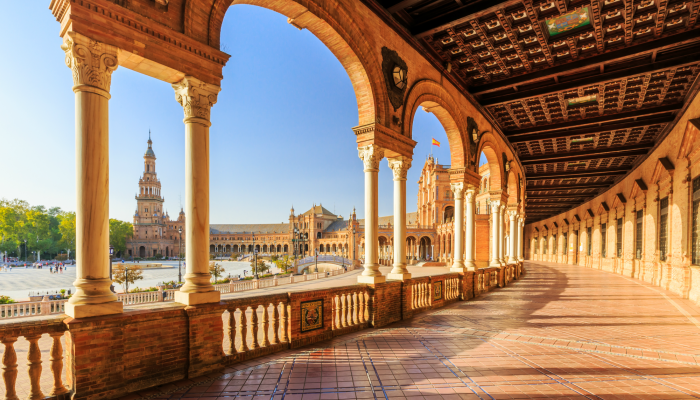 Spanning an enormous 17 hectares, it’s the oldest functioning royal palace in Europe today and its use of Mudéjar architecture helped it to achieve UNESCO World Heritage status in 1987. Must-sees include the Salon de Embajadores, the main room used by King Peter of Castile during his stays and therefore the most elaborately decorated. As well as the Patio de las Doncellas courtyard with its intricately carved archways. Considering it’s the largest gothic building on Earth, it seems bizarre to think that Seville Cathedral possesses Moorish roots. Back in the 12th century its perch initially housed the city’s great mosque, which was turned into a Christian place of worship after the Reconquista. 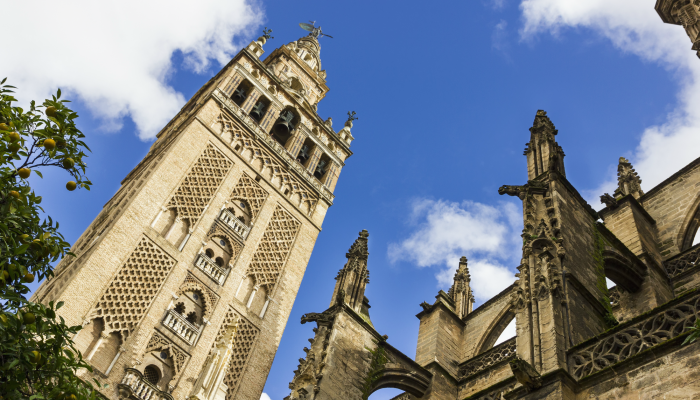 The bottom half of the minaret, or the Giralda as its now known, is one of the mosque’s few remaining parts. Climb to the top for fantastic views over Santa Cruz and the Alcázar. You’ll also find that some of Christopher Columbus’ remains are buried here alongside his son’s. Awarded UNESCO World Heritage status in 1987 because of its contents, the General Archive of the Indies is contained within the old merchants’ exchange of Seville. 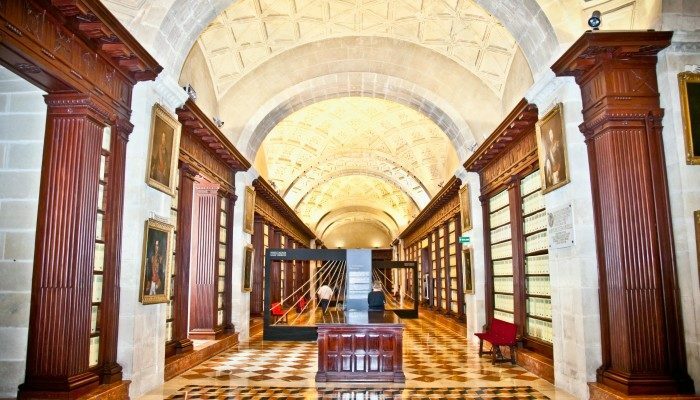 The extensive collection of archival documents kept here, some 800 million pages to be precise, are crucial for understanding the history of the Spanish Empire and its various colonies. Previously dispersed across several archives throughout the country, it was by order of King Charles III in 1785 that they should all be brought together under one roof. Trailing off from Plaza de la Virgen de los Reyes, the square next to the cathedral, is Calle Mateos Gago. 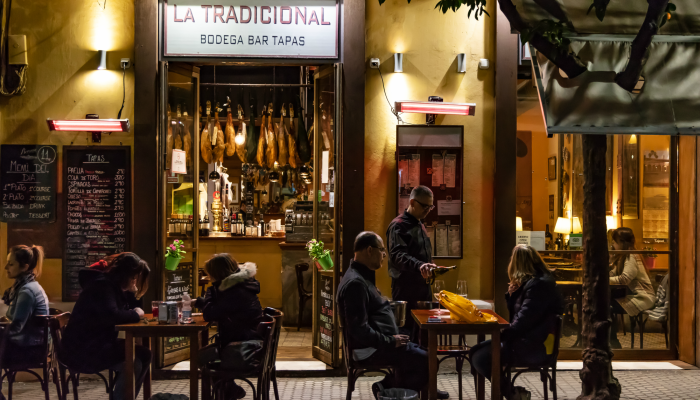 This buzzy street is lined with lively tapas bars serving up all the tastiest Spanish morsels. 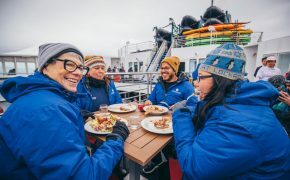 Choose between sitting at an outside table in the sun for a spot of people watching or opting for a cosy corner indoors and embracing the ambience. 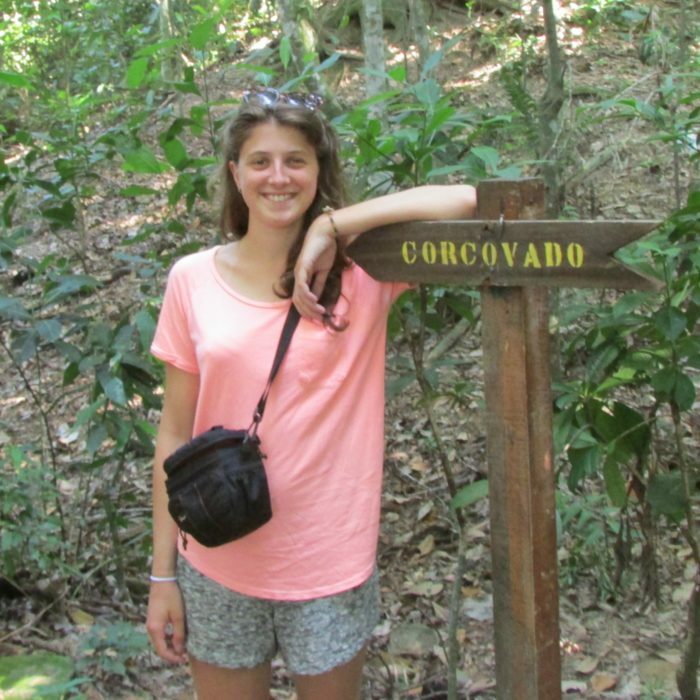 One insider tip shared by Sandra, our local Sevillian guide, was that the further down you walk, the more authentic the restaurants become. So, don’t be tempted to stop at the first one you see. Over 100 different 0peras are set in Seville and written by some of the most famous composers on the planet, such as Mozart, Verdi, Rossi and Beethoven. 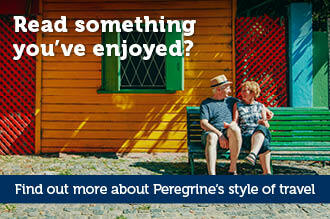 A handful of the best-known titles include Carmen, The Barber of Seville and The Marriage of Figaro. Given this, it’s not really any wonder that Seville is also referred to as the City of Opera. 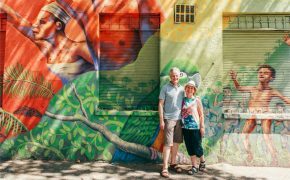 You can visit attractions like the old tobacco factory where Carmen rolled cigarettes or choose to follow in the footsteps of three operatic characters on walking routes laid out around the city. 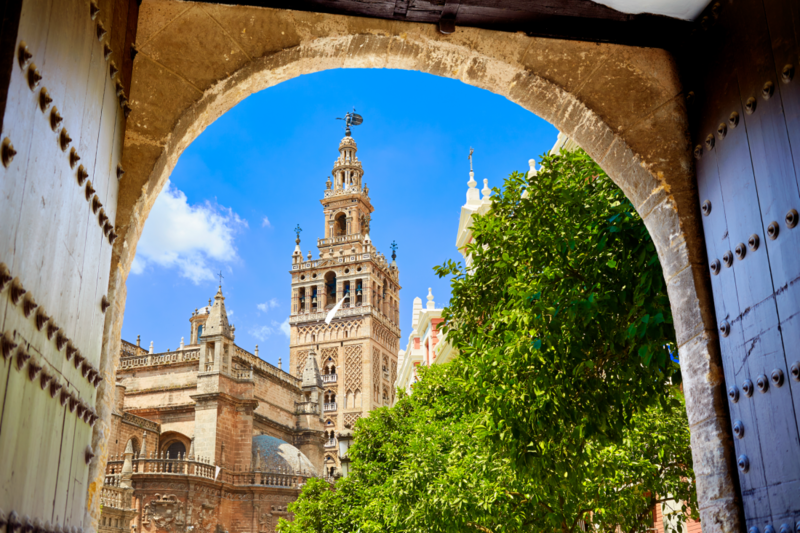 Learn to love Seville like the locals do on a Peregrine Adventure Cruise along the coast of Spain, Portugal and Morocco.